U.S. border cities that serve as trade hubs could be hit hard. President Donald Trump's threats to close the U.S.-Mexico border would have disastrous consequences for U.S. trade and commerce, potentially costing billions of dollars, economic experts and local border-area leaders said Friday. Mexico is the United States’ third largest goods trading partner, according to the Office of the U.S. Trade Representative, and ranked as the second largest U.S. goods export market in 2017. While Mexico would see a proportionally greater impact, a border closure could also increase inflation and unemployment rates in the U.S., according to Moody’s Analytics Director Alfredo Coutino. "The economic impact would depend on the duration of the border closure but could very well amount to billions of dollars," Coutino wrote in a Moody’s analysis. 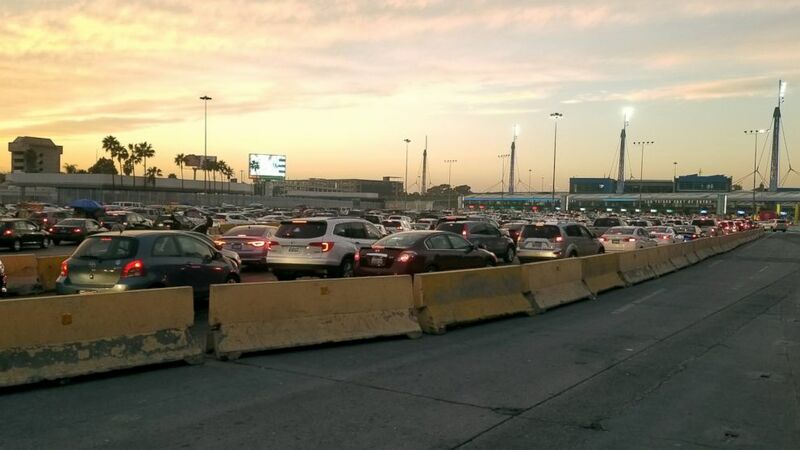 (Quinn Owen/ABC News) Lines of cars wait to enter the U.S. at the San Ysidro border crossing, Dec. 21, 2018. On Friday, Trump tweeted: “We will be forced to close the Southern Border entirely if the Obstructionist Democrats do not give us the money to finish the Wall." Trump also suggested Friday that shutting down the border with Mexico would somehow generate "profit" for the U.S. When asked by ABC News for any evidence or explanation of that claim, the White House did not respond. Duke University Economics professor Craig Burnside said the White House is making bad policy decisions to win political fights. “Nothing good will come of it, that’s for sure,” Burnside said in an email to ABC News. Trade with Mexico in October 2018 alone was valued at more than $50 billion with nearly $40 billion of those goods crossing the border in freight trucks, according to the Bureau of Transportation Statistics. And the San Ysidro port of entry near San Diego is the busiest international border crossing in the Western Hemisphere. In November, when a large group of people attempted to cross and San Ysidro was ordered closed for more than six hours, the economic impact was immediately felt by surrounding businesses in San Diego. The San Diego Chamber of Commerce reported a loss of $5.3 million, and hundreds of businesses were forced to close for the day in the immediate border area, the organization's vice president, Paola Avila, told ABC News. Commercial trade between Tijuana and San Diego is valued at $2.1 million per day, according to the San Diego Chamber of Commerce. But the impact of a closure extends to the group of more than 90,000 people who cross daily into the U.S. through San Ysidro by car or on foot. Many people commute from Tijuana to work and go to school in the U.S.